Up and down the country, thousands of us finished work for Christmas with a sense of relief and perhaps even satisfaction, another gruelling season of delivering meals/presents/disappointment to the great British public in the bag. As the nation turned our attention to sitting on Amazon to avoid spending time with our families, thousands of City Link workers received an email saying they were to lose their jobs. It takes a special kind of wanker to use a workforce to deliver what the company bragged would be its best peak season ever – and then sack them on Christmas day. Step forward, former Tory donor, now avid UKIP supporter and the boss of the private equity firm which runs City Link, Jon Moulton. Of course, they actually called in administrators Ernst & Young, leaving it to union reps to send emails to the 2,727 City Link workers. Many of those most affected would have found out when they turned on the telly, to see the Queen, the Pope and the General Secretary of the RMT deliver festive tidings of reconciliation, reconciliation and impending redundancies respectively. Moulton’s company Better Capital bought City Link for a whole pound last year, promising to turn the firm around. In reality, the firm continued to fail to turn a profit in a market where competitors like Yodel were employing an army of self-employed subcontractors and agency temps to throw things in your wheelie bin or dump them in a neighbouring close/river. 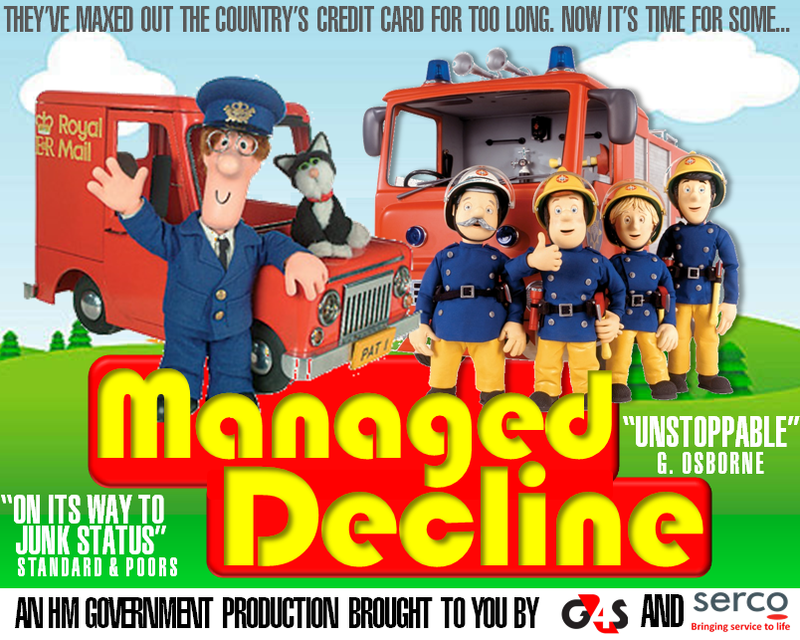 The race to the bottom, spurred on by the privatisation of Royal Mail, has created the perfect climate for the casualisation and wanton destruction of what was once the postal service. Many City Link drivers had been forced into “self-employment”, in what was sold to the workforce as an attempt to cut overheads but now seems like blatant dishonesty in an attempt to transfer what they knew would be useless assets. Many of those most affected aren’t on the direct City Link payroll and will have taken on the cost of vehicles and fuel and paid for road tax, uniforms and all the things an employer is supposed to provide, with the expectation of being paid back at a future date. The same applies to hundreds of subcontractors, many of whom have tens of thousands of pounds in unpaid invoices. The total number of jobs affected is now said to be closer to 5,000, when everyone involved in the supply chain is considered. So despite getting himself into debt delivering your parcels, Rudolph, the self-employed subcontractor finds himself a mere “unsecured creditor” and will have to wait until Better Capital have raided Santa‘s sack. It’s unlikely the millionaire Jon Moulton, who donated nearly half a million quid to the Tories over the years before turning kipper, would have sobbing into his Christmas pudding, from his London pad or maybe his Kent vineyard or perhaps his residence in the tax haven of Guernsey. Moulton previously made clear he’s not concerned about individual companies going under and believes we must “accept a far higher rate of corporate failure” to deliver vicious spending cuts. What’s less clear is why his workforce should be made to pay for his corporate failure. It’s becoming clearer as more details emerge that Better Capital were engaged in a plan to dump the risk on to the City Link workforce before “realising” the assets themselves. We’re all in this together – the bosses get the presents, while the workers are left with the Christmas credit card bill. 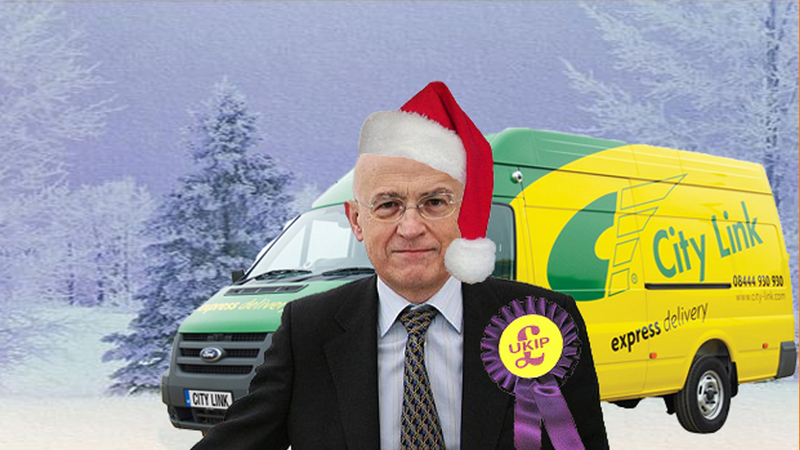 And by we, we mean UKIP now, coz nobody likes Brussell’s sprouts. So if you think your hangover’s bad today, spare a thought for the thousands who were conned into getting themselves into debt, working for nothing to make sure John Moulton got to fill his stockings when the administrators moved in. What an unseasonable wanker. Shared the posting with this comment. I’m researching your Jon Moulton/UKIP link for truth. There is only smears and innuendoes but no actual proof. I meant to add the initial link, where he first endorses UKIP policies (http://www.londonlovesbusiness.com/business-news/politics/but-would-you-vote-ukip-london-business-leaders-talk-candidly/5458.article). As little as 3 days ago, he was noted as being “sympathetic” to UKIP in the trade press (http://www.thisismoney.co.uk/money/markets/article-2932127/Does-Jon-Moulton-midas-touch.html). UKIP are clearly embarassed by the connection being made but they’ve always been more than happy to share anything Moulton has had to say in the past (https://twitter.com/ukip/status/382832137675608065). So if you want to complain about smears, feel free to contact every single news outlet who’s made the connection…and the UKIP press office. Good luck with your research!! !